After downloading the app you can ‘Make an Observation’ by uploading a picture of the organism in question and the iNaturalist database will give you closely matched options. If the app does not automatically find a perfect match, the community of citizen scientists can suggest species information and help identify your unknown sample. Simple design and easy to use app. Having these crowdsource observations by citizen scientists has created a large database with geographic species data. When a picture is taken the date and location data is uploaded with the image. This helps iNaturalist track the habitats and possible migration patterns of organisms living around the world! 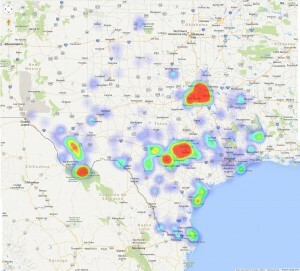 Heat-map of species data on iNaturalist. This year our Biology department is using this app with our students and it has been very encouraging to hear students getting really excited about exploring the natural world around them! One student even uploaded pictures of a starfish and sea-horse from their vacation last spring. With the date and location information stored with the picture, the community of citizen scientists helped identify the specific species of starfish and sea-horse my student had observed several months prior. All of this happened over night and with just one click of the upload button. Our class now uses this app when we go out on our “nature walks” through our courtyard. We have identified species of praying mantis, ants, mosquitoes, asters, milkweeds, aphids, and several spiders still needing identification. People have even helped discover new species using this app! Our classes will soon have a reward system for uploading observations and making identifications. Adding some incentive to get out and spend time in nature. Already, many students have commented how many more living things there are just in the courtyard at school. It is easy to look outside and see the grass, flowers, and some spiders. Actively searching for small insects and unique plants has really help expose how active the natural world is all around us. The one thing I would suggest is to ensure the sharing settings are on private. I do not want someone to find out I make most of my observations around my home and then learn where I live by tracking the plants I have uploaded. The app makes this pretty easy to adjust as well. Also, this is a nature database. It is not intended for houseplants or pets. Also, the user that downloads the app needs to be 13 or older. Changing privacy settings is simple. So next time you happen across an odd bug or a beautiful flower you will be ready to identify what in the world you are observing. You might also add some valuable information to the growing database of species information. There is also the outside chance you will discover a new species! With an increasing number of games and mindless apps on our devices, I have found iNaturalist to be a nice middle ground between being on a device and enjoying more of the natural world. If you give iNatualist a chance, please consider commenting on this post. I am curious to see what people can find and what other features the app has to offer. Get out there and enjoy! Peace.